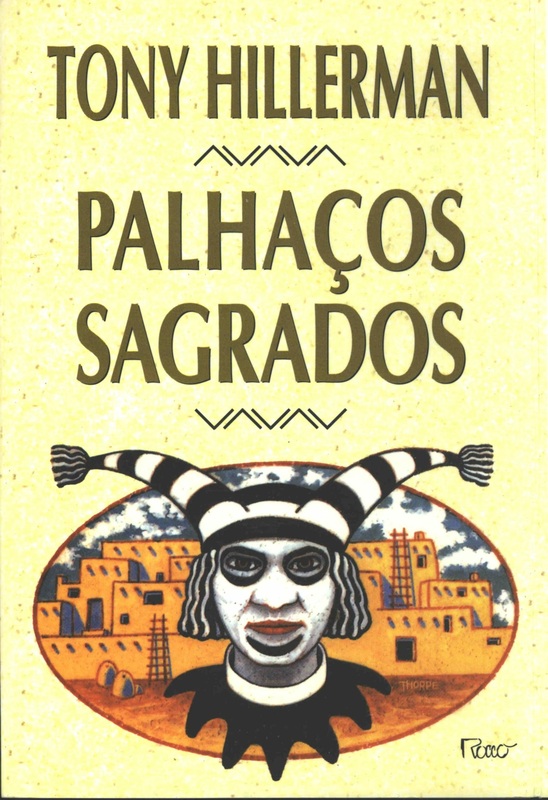 This is the full and detailed views of the 1999 Brazilian paperback edition of Sacred Clowns, printed in Portuguese. This edition was published by Editora Rocco LTDA in Rio de Janeiro, Brazil. The text was translated into Portuguese by Alyda Sauer. Design and Photography Credits: The cover is a reproduction of the HarperCollins first edition dust Jacket, designed by Peter Thorpe, who has designed and illustrated over 40 Hillerman editions and whose work has become the iconic imagery associated with Hillerman's novels. The cover depicts a koshare or Pueblo Clown with an Ancient Pueblo house behind the clown. This edition has fold-out sections on the front and back covers. The front fold-out contains a synopsis of the story and the back fold-out contains a picture and a brief biography of Tony Hillerman.